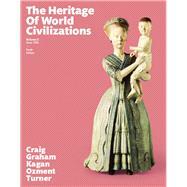 by Craig, Albert M.; Graham, William A.; Kagan, Donald M.; Ozment, Steven; Turner, Frank M.
The Heritage of World Civilizations provides an accessible overview of Asian, African, Middle Eastern, European, and American civilizations with an emphasis on the role played by the world's great religious and philosophical traditions throughout history. Leading scholars in their respective fields, the authors empower students to view the events and processes that have shaped our increasingly interdependent world through a comparative, global lens. MyHistoryLab for the World History course extends learning online, engaging students and improving results. Media resources with assignments bring concepts to life, and offer students opportunities to practice applying what they’ve learned. And Writing Space helps educators develop and assess concept mastery and critical thinking through writing, quickly and easily. Please note: this version of MyHistoryLab does not include an eText. The Heritage of World Civilizations, Tenth Edition is also available via REVEL™, an immersive learning experience designed for the way today's students read, think, and learn. Albert M. Craig is the Harvard-Yenching Research Professor of History Emeritus at Harvard University, where he has taught since 1959. A graduate of Northwestern University, he received his Ph.D. at Harvard University. He has studied at Strasbourg University and at Kyoto, Keio, and Tokyo universities in Japan. He is the author of Choshu in the Meiji Restoration (1961), The Heritage of Japanese Civilization (2011), and, with others, of East Asia, Tradition and Transformation (1989). He is the editor of Japan, A Comparative View (1973) and co-editor of Personality in Japanese History (1970), Civilization and Enlightenment: The Early Thought of Fukuzawa Yukichi (2009). He was the director of the Harvard-Yenching Institute. He has also been a visiting professor at Kyoto and Tokyo universities. He has received Guggenheim, Fulbright, and Japan Foundation Fellowships. In 1988 he was awarded the Order of the Rising Sun by the Japanese government. William A. Graham is Albertson Professor of Middle Eastern Studies in the Faculty of Arts and Sciences and O’Brian Professor of Divinity and Dean in the Faculty of Divinity at Harvard University, where he has taught for thirty-four years. He has directed the Center for Middle Eastern Studies and chaired the Department of Near Eastern Languages and Civilizations, the Committee on the Study of Religion, and the Core Curriculum Committee on Foreign Cultures. He received his BA in Comparative Literature from University of North Carolina, Chapel Hill, an A.M. and Ph.D. in History of Religion from Harvard, and studied also in Göttingen, Tübingen, Lebanon, and London. He is former chair of the Council on Graduate Studies in Religion (U.S. and Canada). In 2000 he received the quinquennial Award for Excellence in Research in Islamic History and Culture from the Research Centre for Islamic History, Art and Culture (IRCICA) of the Organisation of the Islamic Conference. He has held John Simon Guggenheim and Alexander von Humboldt research fellowships and is a fellow of the American Academy of Arts and Sciences. Among his publications are Beyond the Written Word: Oral Aspects of Scripture in the History of Religion (1987); Divine Word and Prophetic Word in Early Islam (1977–ACLS History of Religions Prize, 1978); and Three Faiths, One God (co-authored, 2003). Steven Ozment is McLean Professor of Ancient and Modern History at Harvard University. He has taught Western Civilization at Yale, Stanford, and Harvard. He is the author of eleven books. The Age of Reform, 1250—1550 (1980) won the Schaff Prize and was nominated for the 1981 National Book Award. Five of his books have been selections of the History Book Club: Magdalena and Balthasar: An Intimate Portrait of Life in Sixteenth Century Europe (1986), Three Behaim Boys: Growing Up in Early Modern Germany (1990), Protestants: The Birth of A Revolution (1992), The Burgermeister’s Daughter: Scandal in a Sixteenth Century German Town (1996), and Flesh and Spirit: Private Life in Early Modern Germany (1999). His most recent publications are Ancestors: The Loving Family of Old Europe (2001), A Mighty Fortress: A New History of the German People (2004), and “Why We Study Western Civ,” The Public Interest 158 (2005). Frank M. Turner is John Hay Whitney Professor of History at Yale University and Director of the Beinecke Rare Book and Manuscript Library at Yale University, where he served as University Provost from 1988 to 1992. He received his B.A. degree at the College of William and Mary and his Ph.D. from Yale. He has received the Yale College Award for Distinguished Undergraduate Teaching. He has directed a National Endowment for the Humanities Summer Institute. His scholarly research has received the support of fellowships from the National Endowment for the Humanities and the Guggenheim Foundation and the Woodrow Wilson Center. He is the author of Between Science and Religion: The Reaction to Scientific Naturalism in Late Victorian England (1974), The Greek Heritage in Victorian Britain (1981), which received the British Council Prize of the Conference on British Studies and the Yale Press Governors Award, Contesting Cultural Authority: Essays in Victorian Intellectual Life (1993), and John Henry Newman: The Challenge to Evangelical Religion (2002). He has also contributed numerous articles to journals and has served on the editorial advisory boards of The Journal of Modern History, Isis, and Victorian Studies. He edited The Idea of a University by John Henry Newman (1996), Reflections on the Revolution in France by Edmund Burke (2003), and Apologia Pro Vita Sua and Six Sermons by John Henry Newman (2008). Between 1996 and 2006 he served as a Trustee of Connecticut College and between 2004 and 2008 as a member of the Connecticut Humanities Council. In 2003, Professor Turner was appointed Director of the Beinecke Rare Book and Manuscript Library at Yale University. Part 3: Consolidation and Interaction of World Civilizations, 500 C.E. to 1500 C.E.